Facial nerve schwannomas (FNSs) are rare lesions and can be divided into extratemporal (tumors involving the intraparotid segment of the facial nerve) and intratemporal (tumors involving the intracanalicular, labyrinthine, tympanic, and mastoid segments of the facial nerve) types. Despite presenting either without or with only a mild facial nerve palsy in the preoperative period, following their resection, features of facial nerve paresis are common. Being aware of their characteristic features on preoperative computed tomographic and magnetic resonance imaging helps in their diagnosis and management. Schwannomas, also known as neurilemomas or neurinomas, are benign, slow-growing neurogenic tumors that arise from the Schwann cells, which ensheath axons of peripheral nerves, cranial nerves, and the autonomic nervous system. Facial nerve schwannomas (FNSs) are relatively uncommon and can be divided into extratemporal (tumors involving the intraparotid segment of the facial nerve) and intratemporal (tumors involving the intracanalicular, labyrinthine, tympanic, and mastoid segments of the facial nerve) types. Most of these tumors are seen in the intratemporal course of the facial nerve, whereas only 9% are seen in the extratemporal course and generally appear as an asymptomatic parotid mass. Due to their nonspecific clinical and radiological presentations, it is difficult to establish a correct preoperative diagnosis of FNSs. Owing to their rarity, the imaging findings of FNSs have not been fully described. Most published data have been reported from a surgical perspective. Recognition and understanding the spectrum of imaging findings can aid in their diagnosis. Clinically, most patients with an intraparotid schwannoma do not present with facial nerve palsy, whereas postoperatively, features of facial nerve paresis are common, and these patients should be better informed of this complication prior to their surgery. Malignant transformation of schwannomas is exceptionally rare, and only a few cases have been reported till date. In this study, we present four cases of pathologically-proved extratemporal schwannomas and one case of intratemporal schwannoma. The purpose of this study is mainly focused on analyzing the imaging findings of extratemporal and intratemporal schwannomas in an effort to better characterize the disease preoperatively. A 35-year old man presented with a gradually enlarging, asymptomatic swelling in his right parotid gland that had been present for 2 years. Examination revealed a 3 cm mobile mass, slightly tender and firm in consistency. There was facial asymmetry; however, facial nerve function was intact and no palpable cervical lymphadenopathy was found. The intraoral examination was normal. Computed tomography (CT) scan of the neck region revealed a dumbbell-shaped encapsulated mass located in the lateral portion of the right retromandibular vein that showed a heterogenous enhancement [Figure 1]. A provisional diagnosis of pleomorphic adenoma of the parotid gland was made. A right superficial parotidectomy was initiated. Intraoperatively, the tumor was noted to be originating from the facial nerve trunk. The tumor was completely excised and the portion of the facial nerve branch from which the tumor arose was transected. Postoperatively, he had grade II facial nerve palsy according to the House–Brackmann grading system, but had complete recovery of his facial nerve functions after 5 months. Immunohistopathological examination of the tumor was consistent with the diagnosis of a FNS because the spindle cells were strongly positive for S-100 protein. Follow-up magnetic resonance imaging (MRI) showed no recurrence of the tumor and the patient remained asymptomatic until the last available follow-up visit. A 26-year old man presented with a 4-year history of a slowly growing, asymptomatic swelling on the left side of the face close to the ear. Examination revealed a soft, non-tender lesion measuring approximately 4 × 2 cm. Facial nerve function was intact, and there was no palpable cervical lymphadenopathy. The intraoral examination was normal. Non-enhanced CT scan of the neck region revealed an oval encapsulated, low-density mass with a slightly higher-density appearance internally, located in the deep lobe of the left parotid gland, compressing the adjacent structures. Contrast-enhanced CT scan showed slight enhancement of the mass [Figure 2]. The result of the fine needle aspiration cytology (FNAC) was inconclusive. Parotidectomy was initiated. Intraoperatively, the tumor was noted to be originating from the facial nerve trunk. The tumor was completely removed and the facial nerve branch from which it was arising was transected. Postoperatively, he had House–Brackmann grade IV facial nerve palsy, with complete recovery after 6 months. Immunohistopathological examination of the tumor was consistent with the diagnosis of a FNS because the spindle cells were strongly positive for S-100 protein. Follow-up MRI showed no recurrence of the tumor and the patient remained asymptomatic at follow up visits. A 48-year old woman presented with a 5-year history of a slowly growing, asymptomatic swelling in the left parotid gland. Examination revealed a firm, non-tender mass measuring approximately 2.0 × 1.5 cm. Facial nerve functions were intact and there was no palpable cervical lymphadenopathy. The intraoral examination was normal. Non-enhanced CT scan of the neck region revealed a nodular mass (size: 1.4 × 0.7 cm), with a clear border in the superficial lobe of the left parotid gland. Contrast-enhanced CT scan showed a uniform enhancement of the mass. The CT values of the plain CT image as well as the arterial, venous, and delayed phases were 31, 40, 59, and 83 Hounsfield units, respectively [Figure 3]. A provisional diagnosis of pleomorphic adenoma of the parotid gland was made. A left superficial parotidectomy was initiated. Intraoperatively, the tumor was noted to be originating from the facial nerve. The tumor was completely removed and the facial nerve branch was transected. Postoperatively, she had House–Brackmann grade II facial nerve palsy, with complete recovery after 3 months. Immunohistopathological examination of the tumor was consistent with the diagnosis of a FNS because the spindle cells were strongly positive for S-100 protein. Follow up MRI showed no recurrence of the tumor and the patient remained asymptomatic following her surgery. A 51-year old man presented with a slow growing painless swelling in the right zygomatic arch for the last 1 year. He had a slight right-sided facial weakness. Examination revealed a firm, non-tender mass, measuring approximately 2.5 × 2 cm. Facial sensation and visual acuity were normal. He had House–Brackmann grade II right-sided facial nerve palsy. There was no intraoral swelling or palpable cervical lymphadenopathy. Non-enhanced CT scan of the neck region revealed an oval soft tissue mass (size: 2.5 × 1.7 cm), with a clear border located in the region of the right zygomatic arch. Contrast-enhanced CT scan showed a uniform and marked enhancement of the mass. The CT values of the plain image, the arterial phase, and the delayed phase were 22, 45, and 111 Hounsfield units, respectively [Figure 4]. A provisional diagnosis of a benign tumor, probably an angioma, was made. During surgery, the tumor was adherent to the deep layer of the zygomatic branch of the facial nerve. Removing the tumor from the zygomatic branch was difficult; therefore, the nerve was transected to excise the lesion and then its ends were primarily anastomosed. The patient had a postoperative ipsilateral facial palsy, which gradually improved. Immunohistopathological examination of the tumor was consistent with the diagnosis of a FNS because the spindle cells were strongly positive for S-100 protein. Follow-up MRI showed no recurrence of the tumor and the patient remained asymptomatic at follow-up visits. A 41-year old man presented with a 6-month history of reduced hearing and tinnitus in the left ear. On physical examination, the facial sensation and visual acuity were normal. Audiometry revealed left-sided conductive hearing loss. His CT scan revealed a soft tissue mass in the left mastoid, without significant expansion of the mastoid sinus. There was bone destruction in the anterior wall of the tympanic region of the petrous bone [Figure 5]. MRI showed a dumbbell-shaped mass in the tympanic portion of the left petrous bone that was nearly isointense when compared to the adjacent temporal lobe cortex on T1-weighted image (T1WI) of magnetic resonance imaging (MRI) and mildly hyperintense on T2WI. The mass was extending into the left facial nerve canal and was well-enhancing on gadolinium-enhanced T1WI [Figure 5]. A preliminary diagnosis of a cholesteatoma was made. During surgery, the tumor was noted to be originating from the facial nerve. The tumor was completely removed and the facial nerve fibers that were attached to the tumor were partially transected. Postoperatively, the patient had House–Brackmann grade III facial nerve palsy, with complete recovery after 6 months. Immunohistopathological examination of the tumor was consistent with the diagnosis of a FNS because the spindle cells were strongly positive for S-100 protein [Figure 6]. Follow up MR imaging showed no recurrence of the tumor and the patient remained asymptomatic. FNS are rare, ectodermal, benign encapsulated tumors arising from the Schwann cell ensheathing the facial nerve. These tumors can arise anywhere along the course of the facial nerve, from the oligodendroglial-Schwann cell transition site at the cerebellopontine angle to the peripheral branches in the parotid gland. Facial schwannomas can be divided into extratemporal and intratemporal types. Most of these tumors arise mainly from the intratemporal segment and rarely from the intraparotid segment. The estimated incidence of intraparotid schwannomas originating in the facial nerve ranges from 0.2 to 1.5%. In a retrospective study by Caughey RJ et al., a total of 3,722 patients with schwannomas were reviewed, out of which only 29 cases were related to the facial nerve. From this small figure, only 8 involved the parotid segment of the facial nerve. In our study, four of the five cases presented with an extratemporal FNS and one presented with an intratemporal FNS. Out of four extratemporal FNSs seen, three were intraparotid schwannomas originating in the facial nerve. According to previous reports, schwannomas of the facial nerve can occur at any age but are most frequently observed in the fifth to sixth decade of life with no significant gender bias., The mean age in our study was 40.2 years, and four out of the five patients were male. The most common clinical presentation in patients with an intratemporal schwannoma was facial nerve dysfunction and hearing impairment, whereas in those with an extratemporal schwannoma, the presentation was that of a parotid mass without facial nerve dysfunction. A parotid mass with facial nerve palsy usually indicates the presence of malignancy of the gland, but facial palsy can also be observed in benign parotid masses. However, facial palsy has usually not been reported in patients harbouring an intraparotid schwannoma. Similarly, in our series, the patient with an intraparotid schwannoma presented with a parotid mass without facial paresis; it, therefore, became very difficult to diagnose the schwannoma clinically. The result of fine needle aspiration cytology was also found to be inconclusive in this case. The patient with an intratemporal schwannoma in our study presented with a history of reduced hearing and tinnitus without facial nerve dysfunction, making the establishment of the diagnosis of FNS exceedingly difficult. Ultrasonography (USG), CT scan, and MRI were all used to evaluate these tumors, but failed to diagnose the schwannoma preoperatively. On a CT scan, the appearance of a schwannoma may be highly variable, but is generally characteristic of a well-circumscribed encapsulated mass. The CT scan is able to demonstrate the relationship of the facial nerve canal to the normal anatomic landmarks such as the ossicles, which is often not possible to demonstrate with the MR images. In addition, the CT scan has the advantage of demonstrating the osseous changes within the surrounding bones and evidence of tumor calcification in the ossifying forms of the schwannoma, which may be seen in approximately 50% of the cases. However, previous studies have emphasized that the CT scan is not the ideal imaging modality for evaluation of parotid masses primarily because the soft tissue structures and the facial nerve cannot be well differentiated from one another. The best investigative modality of choice is the gadolinium-enhanced MRI. Regardless of the tumor location, the characteristic imaging findings of a schwannoma are found; the CT scan shows an enhancing soft-tissue mass, and the MRI shows a mass that is mildly hypo- or isointense relative to brain on T1 weighted image (WI), hyperintense on T2WI, and enhances after gadolinium administration. In a retrospective study by Chung et al., all extratemporal schwannomas were located close to the posterolateral portion of the retromandibular vein and extended toward the stylomastoid foramen, consistent with the characteristic position of the facial nerve. However, in our series, out of four extratemporal schwannomas, only one case (case 1) was located close to the lateral portion of the retromandibular vein. Others were located in the deep lobe of the parotid gland (case 2), superficial lobe of the parotid gland (case 3), and close to the zygomatic arch (case 4). Shimizu et al., reported that on a preoperative MRI, three of the five intraparotid FNS exhibited a “target sign” characterized by a hyperintense signal at the periphery of the tumor and a hypointense signal in its centre on T2WI. However, this feature may also be found in other neurogenic tumors such as a neurofibroma and a malignant peripheral nerve sheath tumor. In addition, on a CT scan, a schwannoma that has undergone a cystic degeneration will appear as a multilocular cystic structure with multiple, fine septations and solid areas, often along with calcification within the cyst walls. On MRI, a cystic schwannoma will appear isointense on T1WI, hyperintense on T2WI, and will often feature an area of peripheral enhancement after fat suppression. 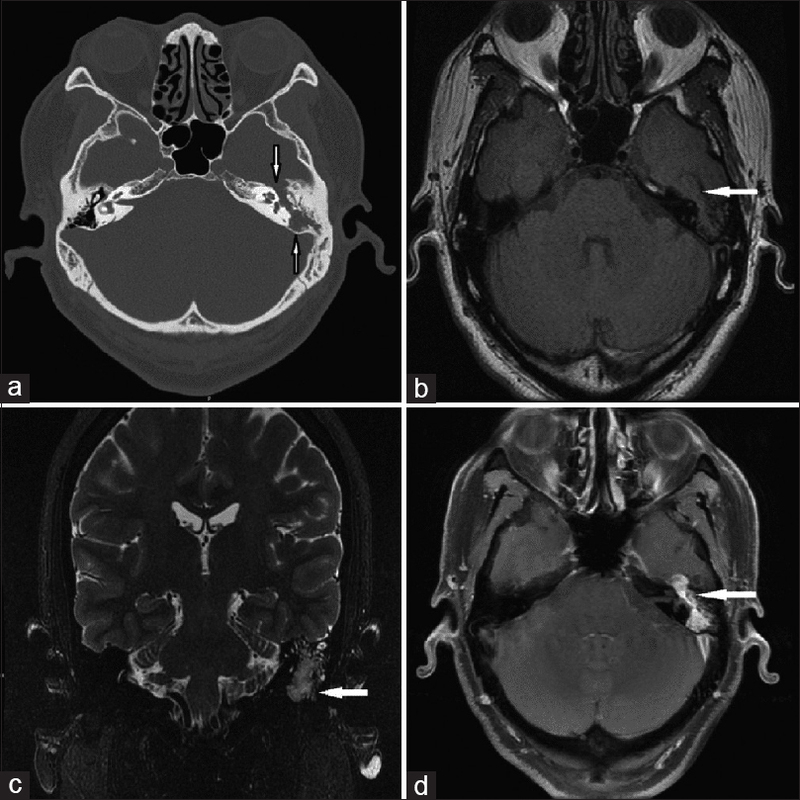 Recently, Jaiswal et al., reported a case of an intraparotid FNS with the characteristic “string sign,” in which the MRI showed that the mass was located just below the stylomastoid foramen with a beak-like protrusion into it. In our series, neither the target sign nor the string sign could be observed in any of the reported cases. The intratemporal schwannomas reported in literature showed the characteristic osseous canal changes along the course of the facial nerve in the tympanic region with homogeneous contrast enhancement on CT scan. MRI showed an iso- to hypointense lesion on T1WI, that was hyperintense on T2WI, and showed a good enhancement on gadolinium-enhanced T1WI. In our study, the single case of an intratemporal schwannoma (Case 5) also revealed similar findings. However, we failed to identify these important signs on the preoperative imaging and, therefore, did not use the curved planar reformation along the course of the facial nerve canal on CT scan images. If we had considered the preoperative diagnosis of a FNS and paid more attention to these signs, the preoperative misdiagnosis could have been avoided. The typical 'dumb-bell' appearance of a facial nerve schwannoma, was present in two of our cases (Case 1 and 5). The heterogeneity of imaging features results in a broad differential diagnosis that makes it exceedingly difficult to preoperatively differentiate a schwannoma from other tumors by imaging. Pleomorphic adenomas or mixed tumors are the most common benign salivary gland tumors, which typically appear as smoothly marginated or lobulated, homogeneous small spherical masses and demonstrate delayed enhancement; however, if the tumor is growing along the course of the facial nerve, a FNS may be reasonably suspected. Warthin tumors are the second-most common benign parotid gland tumors, and typically present as multiple cystic lesions in the tail of the parotid gland. Warthin tumors show significant enhancement in the arterial phase, and the enhancement decreases in the delayed phase. However, the absence of multiple cystic lesions reasonably excluded the possibility of a Warthin tumor in our series. Hemangiomas of the facial nerve typically occur at the geniculate ganglion and show avid contrast enhancement. In our study, although case 4 showed a continuous marked enhancement of the mass, it was located in the vicinity of the zygomatic arch along the course of the zygomatic branch of the facial nerve; hence, a FNS should have been considered. Malignant tumors of nerve sheath origin or adenoid cystic carcinomas with perineural spread tend to grow along the nerve sheath. Such tumors have ill-defined margins, contrary to the FNS, which forms a well-defined mass, and this difference can aid in the differential diagnosis. Cholesteatoma generally shows either no or little contrast enhancement, whereas in our case 5, the mass was extending into the left facial nerve canal and was well-enhancing after gadolinium administration, suggesting the diagnosis of a FNS. The definitive diagnosis of FNS can only be made on the basis of histological examination and immunohistochemistry studies of the resected specimen. A characteristic feature includes abundant spindle-shaped cells that are strongly positive for S-100 protein. In our series, all cases showed similar immunohistopathological findings consistent with the diagnosis of a FNS. Surgical excision of the tumor is the primary mode of treatment of a schwannoma, but the timing of surgery is linked to the facial nerve function. However, because the diagnosis of FNS is often not established preoperatively, a decision on the management of the facial nerve is usually made intraoperatively. As postoperative facial nerve paresis or palsy is common, the patient should be followed-up to monitor facial nerve function as well as recurrence of the disease. The preoperative diagnosis of a FNS is exceedingly difficult to establish owing to its rarity and nonspecific clinical and radiological presentations. A CT scan could aid in the diagnosis of FNSs; however, the gadolinium-enhanced MRI usually provides more specific characteristics. A high index of clinical suspicion along with detailed neurootological and radiological studies are of paramount importance in establishing its preoperative diagnosis. Further research with a large population of patients is necessary to better characterize the imaging features of facial nerve schwannomas. This study was supported by the National Key Clinical Specialties Construction Program of China (No. 2013-544). Chung SY, Kim DI, Lee BH, Yoon PH, Jeon P, Chung TS. Facial nerve schwannomas: CT and MR findings. Yonsei Med J 1998;39:148-53. Forton GE, Moeneclaey LL, Offeciers FE. Facial nerve neuroma. Report of two cases including histological and radiological imaging studies. Eur Arch Otorhinolaryngol 1994;251:17-22. Fletcher CDM. Diagnostic histopathology of tumours, Third Edition, Vol 2. Churchill Livingstone-Elsevier, London; 2007. Nadeau DP, Sataloff RT. Fascicle preservation surgery for facial nerve schwannomas involving the posterior cranial fossa. Otol Neurotol 2003;24:317-25. Chiang CW, Chang YL, Lou PJ. Multicentricity of intraparotid facial nerve schwannomas. Ann Otol Rhinol Laryngol 2001;110:871-4. Caughey RJ, May M, Schaitkin BM. Intraparotid facial nerve schwannoma: Diagnosis and management. Otolaryngol Head Neck Surg 2004;130:586-92. McCarthy WA, Cox BL. Intraparotid schwannoma. Arch Pathol Lab Med 2014;138:982-5. Guzzo M, Ferraro L, Ibba T, Quattrone P, Bianchi R, Rezzonico S, et al. Schwannoma in the parotid gland. Experience at our institute and review of the literature. Tumori 2009;95:846-51. Nader ME, Bell D, Sturgis EM, Ginsberg LE, Gidley PW. Facial nerve paralysis due to a pleomorphic adenoma with the imaging characteristics of a facial nerve schwannoma. J Neurol Surg Rep 2014;75:e84-e88. Thompson AL, Aviv RI, Chen JM, Nedzelski JM, Yuen HW, Fox AJ, et al. Magnetic resonance imaging of facial nerve schwannoma. Laryngoscope 2009;119:2428-36. Lee YYP, Wong KT, King AD, Ahuja AT. Imaging of salivary gland tumors. Eur J Radiol 2008;66:419-36. Shimizu K, Iwai H, Ikeda K, Sakaida N, Sawada S. Intraparotid facial nerve schwannoma: A report of five cases and an analysis of MR imaging results. AJNR Am J Neuroradiol 2005;26:1328-30. Martin N, Sterkers O, Mompoint D, Nahum H. Facial nerve neuromas: MR imaging. Neuroradiology 1992;34:62-7. Jindal T, Mukherjee S, Kamal MR, Sharma RK, Ghosh N, Mandal SN, et al. Cystic schwannoma of the pelvis. Ann R Coll Surg Engl 2013;95:e1-e2. Hayashi Y, Watanabe T, Kita D, Hayashi Y, Takahira M, Hamada J. Orbital cystic schwannoma originating from the frontal nerve. Case Rep Ophthalmol Med 2012;2012:604574. Jaiswal A, Mridha AR, Nath D, Bhalla AS, Thakkar A. Intraparotid facial nerve schwannoma: A case report. World J Clin Cases 2015;3:322-6. Thoeny HC. Imaging of salivary gland tumours. Cancer Imaging 2007;7:52-62. Yousem DM, Kraut MA, Chalian AA. Major salivary gland imaging. Radiology 2000;216:19-29. Isaacson B, Telian SA, McKeever PE, Arts HA. Hemangiomas of the geniculate ganglion. Otol Neurotol. 2005;26:796-802. Teresi LM, Lufkin RB, Wortham DG, Abemayor E, Hanafee WN. Parotid masses: MR imaging. Radiology 1987;163:405-9.